If you've read my blog before, it will come as no surprise to hear that I swear by Deliciously Ella's approach to eating well. I've said it before and I'll say it again, her recipes are delicious, packed with goodness and practical! No fad dieting, no depriving yourself of any enjoyment in your food and no spending most of your day in the kitchen preparing just one meal. Just simple recipes made using natural plant based ingredients. She's my good food guru if you will. You'll find me in my Deliciously Ella recipe books at some point every week and I love them! If I'm pressed for time I'll whip up a batch of Raw Brownies (using just three ingredients!!) or if I've got a little longer, I'll try my hand at a Chocolate Ganache Cake. But, as man can't live off desserts alone, her easy weekday dinners have been a hit in our household too, with leftovers saved for work lunches. 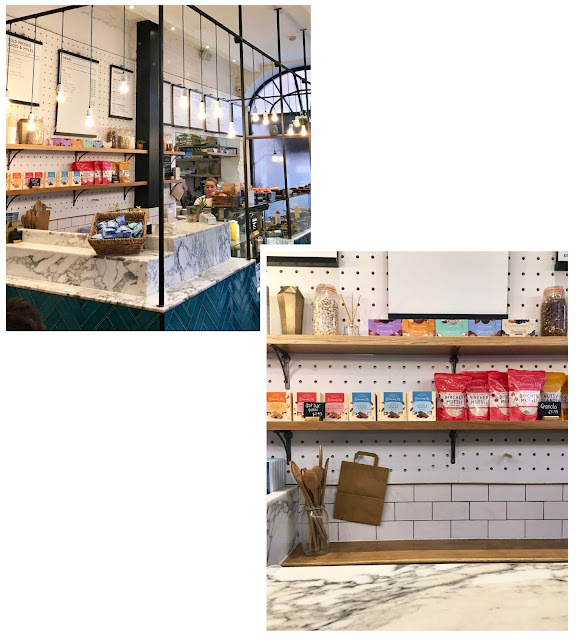 I've been dying to visit a Deliciously Ella Deli ever since the first one opened back in 2016, and on a recent trip to London I finally made it to my Mecca. ...we took shelter on a grey rainy Monday. The Deli's decor boasts an organically cool feel. Simple, modern and pretty. It's stylish without being too try-hardy, if you catch my drift! There's a huge table for people to sit around in a lovely community sort of a way, or you can keep yourself to yourself and watch the world go by seated at the window. The menu includes dishes such as Thai Yellow Coconut Curry and Cauliflower & Red Lentil Dhal, reasonably priced at just under £9.00 for most of the lunch and dinner options. I went for the warming Cauliflower & Red Lentil Dhal and an organic pressed juice. I maaaay have bought a couple of Fudge Brownies for the journey back up North. What's a day out without a few treats?! The Deli was every bit as lovely as I'd known it would be. Laid back and comfortable, a reflection of the Deliciously Ella 'no pressure' approach to eating and living well. I strayed from healthful eating over the Christmas period, because, well, Christmas, and it was the first time that I felt a noticeable slump in my energy levels and dare I say it, happiness. It's true, I'm happier when eating Quinoa. I'm also happier when I'm off work on a Monday and watching the world go by from the window of a Deli but what can you do? You can find the Deli locations here if it's tickled your pickle. In the meantime, whose up for signing my petition to bring a Deliciously Ella Deli to the North?! There's a limit to how many butter pies I can take.